I've recently (early in 2016) re-banded some of the mid-90s 2nd-edition D&D players I had, and we're now playing a 5th-edition online version (via google hangouts) of Planescape, one of the major campaign worlds that I felt I never got to explore enough of back in the day. Thanks to the flexibility and encouragements of the 5th edition rules the game constantly revolves around the choices the players make for their characters. And since Planescape in general is a epic-scale "battle of beliefs," where not only the characters choices but also their beliefs have a tendency to influence the "reality" of the game ... well. Its been a blast. 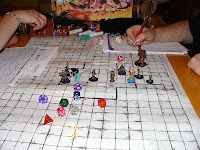 For example, one player is a half-orc fighter. He was born in a savage neanderthal-like society on a distant ice planet. When he accidentally triggered a world-spanning portal and wound up in a "civilized" planar society he immediately got into trouble, was arrested, imprisoned, and eventually conscripted into an army. During his two years in the army he learned several languages, but also several morality structures. When he discovered his lawfully-oriented army was using him to burn down chaotically (i.e., freedom-oriented) aligned villages he went AWOL. Those decisions in his backstory have created all kinds of consequences in his current life -- usually running from the police and other lawful authority figures who could trace his desertion from the army and land him back in prison. At the same time, when he was in a particularly run-down area of the city he's in, he was witness to a pair of homeless equipped with crossbows who ambushed and attempted to slaughter four of the local police. The half-orc stepped in and stopped the carnage -- resulting in one of the police recognizing him, the last surviving former member of his previous army patrol. Things are deliciously complicated now as the half-orc has to try and balance all his various loyalties. And that's just one of the four characters. Doing things in this way, using the backstory of a character as a major part of the plot of the game, definitely increases the buy-in from all the gamers involved. We're having crazy fun with all the complications. Man, that sounds like a great campaign! Just the kind of delicious intrigue that I love. Every time my backstory makes an appearance in a game, I'm 100% there--increased buy-in is right!